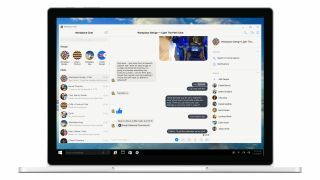 In celebration of the one-year anniversary of Workplace, Facebook has launched a new desktop app to facilitate group chats. Workplace Chat has always been available via mobile apps and in the browser on a PC, but now there’s a fully-fledged desktop app for PC and Mac, something which has been on the wish-list of many for a while now. The desktop software offers the same features as seen on the mobile apps. It includes one-to-one or group chats, and also file sharing, plus screen sharing, the latter of which will be a definite boon in the business environment. There are some slightly more frivolous trimmings, too, such as ‘@mentions’, message reactions, and the usual GIFs to throw in for a bit of color. Facebook also revealed that in the coming weeks, group video chat will be rolled out on both desktop and mobile apps. Additionally, Facebook is giving existing Workplace apps a fresh coat of paint with a new look which is more consistent across different platforms. In a bit of trumpet-blowing accompanying the release of this software, Facebook noted that some 30,000 organizations are now using Workplace across the globe, and that number has doubled since April. No less than a million plus groups have been created on Workplace to date.